The Guinness Book of World Records holds some fascinating information about people all over the world who have beaten the odds and had the honor of holding a world record. Most of the ones we see or hear about are the athletic or odd world records, but there are in fact several crochet world records, held by people around the world from the USA to India. Read on to learn some facts about the fastest crocheter, the longest crochet chain, and the biggest crocheted blanket ever made. In 2005, Lisa Gentry landed the world record as fastest crocheter when she showed up to a Michael’s Arts & Crafts Store in Louisiana and began hooking shell stitches. The number of stitches per minute? 170 – for a total of 5,113 stitches in just half an hour. In 2008, Anne Vanier-Drussel of France began working on what would become the longest crochet chain in the world, measuring a total of 130 kilometers (or just above 80 miles). Once completed, it was taken to Aniane, France to be measured and presented for the world record. 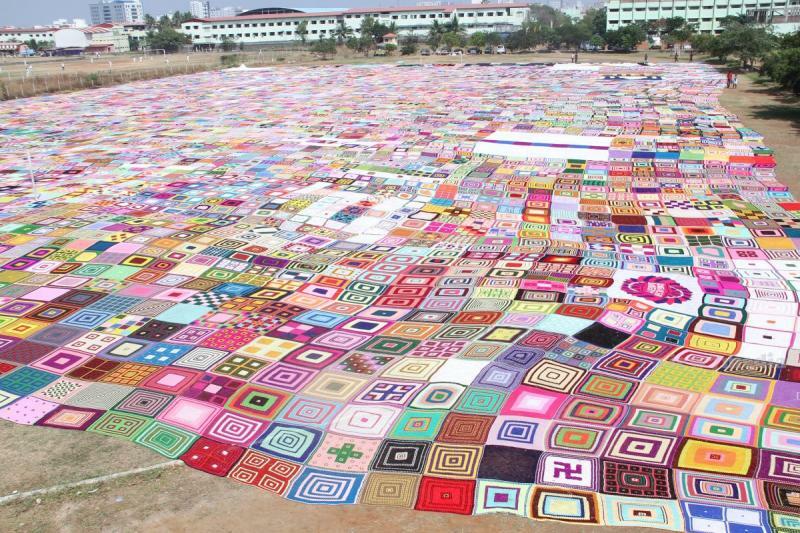 In 2016, the largest blanket ever crocheted was made by 1,500 inmates in 30 correctional centers around South Africa, measuring 185,016 square feet. Drakenstein Correctional Center, where the final assemblage took place, had housed Nelson Mandela for a short period prior to his release.